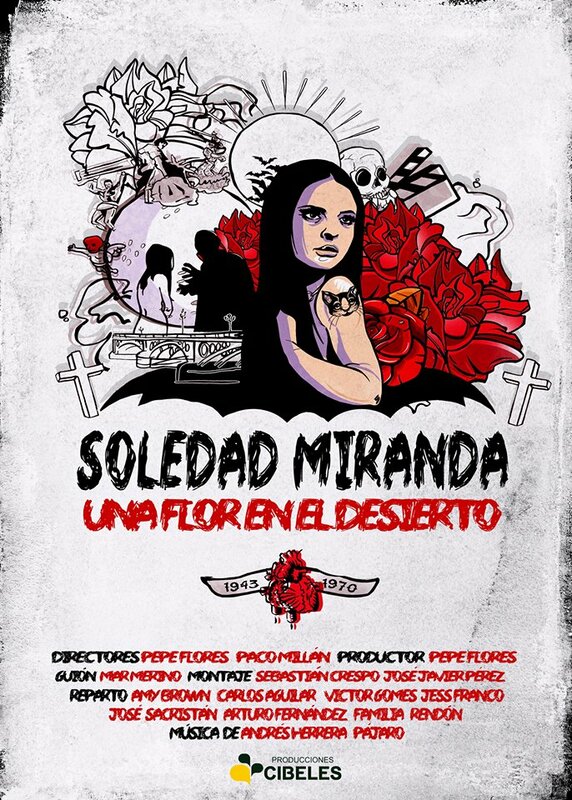 Directed by Pepe Flores and Francisco Millán and written by Mar Merino, SOLEDAD MIRANDA. UNA FLOR EN EL DESIERTO is a documentary which tries to tell us all about this cult Spanish actress. Soledad Miranda worked as an actress for some directors including Javier Aguirre during the 60s but it was in the 70s, after meeting Jess Franco, when she reached the top. She made 8 movies with him and then she died in car accident when she was only 27 years old. Before you feel brave enough to watch this doc you have to take into consideration that it has been made by Cibeles producciones, a company specialized in TV productions, being no fans of experts on Spanish cinema, Soledad Miranda, Jess Franco or anything close to these. No love for the genre is shown. This doc was shown once at SITGES fest 2015 and then broadcast on a local Spanish TV channel. I imagine there are no plans for DVD/Blu-Ray or VOD release. Soledad Miranda’s life is presented through the perspective of one of her biggest fans: Amy Brown (soledadmiranda.com). We, as spectators, follow her from her house in USA to Teatro Quintero in Seville, where a tribute to the actress will be held. Apart from Amy’s we find very interesting commentaries, stories and anecdotes by Jess Franco (archive footage), Jack Taylor, Victor Gomes, José Sacristán and her family. So far it does not sound like a bad project, does it? But, to tell you the truth this is one of the most insane-WTF docs I have ever watched. Since the very beginning I felt an extreme embarrassment for the crew behaviour towards Ms. Brown. They seem to be looking for and provoking her sadness, pain and tears at the same time they did not care about her feelings or convenience. Were they conscious of the way they were portraying her? She is a die-hard fan who really admires Soledad, she feels her as part of her life and she will obviously cry remembering the actress’s saddest moments. Is there a point in keeping the camera close-up on her tears for over two minutes? Obviously, she is not familiar with Spanish sacred traditions; the heads of the ones behind the camera must have dropped in shame after shooting her dressing like a mourner in search of Mirada’s tomb in Portugal, becoming one of the most uneasy moments in the history of docs. When I decided to watch this doc I felt like getting to know Soledad Miranda better but I never expected to be a witness of a nonsense show. It is true that you may learn about her life and work but I think it is not worth at all. I have been trying to contact the production company more than twice for almost a year just to ask them why but never did I get a reply! Previous story ULTRAinocencia IS GETTING READY!